At Family Owned Spot Farms, we believe knowing where your dog’s food comes from is just as important as knowing what’s in it. That’s why we go right to the source, working closely with small family farmers across the USA. Our farmers raise their animals the right way, feeding them an all-vegetarian diet and never using antibiotics. Chock full healthy nutrients and probiotics our wholesome, human grade recipes are bursting with a flavor your dog will love. Mix up a delicious meal for your pup you can both feel good about! 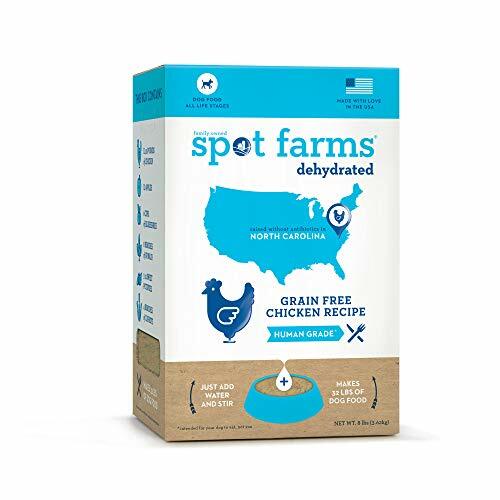 Spot Farms Grain Free Chicken recipe is formulated to meet the nutritional levels established by the AAFCO Dog Food Nutrient Profiles for all life stages, including the growth of large size dogs (70lbs or more as an adult). Dog Size Dry Cups/Day* Under 5 lbs 1/4 – 1/2 cup 5-15 lbs 1/2 – 1 cup 15-30 lbs 1 – 1 1/2 cups 30-50 lbs 1 1/2 – 2 1/4 cups 50-75 lbs 2 1/4 – 3 1/4 cups 75-100 lbs 3 1/4 – 4 cups * We suggest dividing the daily amount into two servings. Your individual dog’s needs will vary with age and activity. For puppies serve up to 50% more than the amounts listed. For pregnant or nursing dogs you may feed up to 2-3 times listed amounts. For dogs over 100 lbs please add 1/4 cup for every 10lbs over 100lbs. Food that has been rehydrated, but not fed, may be refrigerated for up to 2 days.Grain Free: Dehydrated And Made With Probiotics For Easier Digestibility, This Healthy Dog Food Is Made In The Usa With No Antibiotics Ever Cage-Free Chicken Raised In North Carolina. No Animal Meal: Only Real Meat. You Won’T Find Any Feed Grade Ingredients Like Chicken Meal, Lamb Meal Or Fish Meal Here. All Natural: Spot Farms Dog Food Has No By-Products And No Artificial Flavors, Colors Or Preservatives. Just Add Water And Stir For A Delicious, Nutritious Meal.